Ready to join a student-led campus tour of our newly-renovated beautiful campus? We’re excited to show you around! You can even customize a visit through our welcome center manager and get to know our dedicated faculty and staff while you’re on campus. High schools and non-profit organizations may bring groups of up to 50 students for group tours. Schedule your visit today! Our 100-acre campus is beautiful and picturesque, with a Normanesque castle overlooking a quad designed by Frederick Law Olmsted, the landscape architect who designed Central Park. Our close proximity to New York City supports numerous internship and networking opportunities, as well as access to one of the most important metropolitan areas in the world. Can't make it to campus? 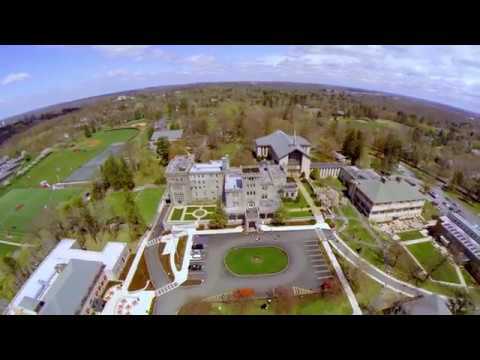 Get a feel for Manhattanville without leaving home by viewing our photo and video galleries. We’d love to see you on campus! Manhattanville campus tours and presentations are offered Monday through Friday at 10:00 a.m., 12:00 p.m. and 2:00 p.m. There are select Saturday tours and presentations at 10:00 a.m., 11:30 a.m. and 1 p.m. Additionally, there are also spring Sunday selected tours available with tours at: 10 a.m. and 11 a.m. (Sundays dates are tours only). Schedule your tour now. We also have a convenient virtual tour if you can’t make it to campus. On our virtual tour, you can view a map of campus with pictures and descriptions of notable places, such as Reid Castle and Founder’s Hall. High Schools, non-profit organizations and counselor groups that would like to coordinate a chaperon led group visit of up to a maximum of 50 students are welcome to visit and learn more about Manhattanville College. Please fill out this form to register for a student led weekday campus tour and please read the criterion for scheduling such a visit. Group visits are on a first come first served basis. There is a full range of choices for high school students including sophomores, juniors, seniors, admitted seniors, international and transfer students. Each event is designed to highlight all aspects of the college experience here through venues such as: open house events, mock classes, student led weekday and selected Saturday and Sunday campus tours and options designed exclusively for admitted high school seniors. Consider also attending our very popular Faculty Academic Presentations where you will learn directly from our professors about many of the academic programs at the college – each of these offered dates will highlight different academic majors. Take advantage of one or more of these great options and register to learn more about why students from 55 countries and 33 states have chosen Manhattanville College to help prepare them for their future. Our enthusiastic student tour guide staff will provide a comprehensive informational tour of our newly renovated campus for our prospective students, their families, and for all campus visitors. In addition, they will share with you their own great personal college experiences. Join them for a guided walking tour and discover for yourself why they are proud to call Manhattanville College home! Joseph Garzione is the College's Welcome Center Director. As the front-line representative of the college, Joe coordinates customized visitation options, information sessions, and events for visiting prospective students and their families. Have questions about events, campus tours, or need help finding a location? Call or email Joe. He's here to help! Our scenic campus is located in Purchase, about 30 miles from New York City, which gives students access to tons of internships and other opportunities. The campus was founded in 1841 and spans 100 acres. It was designed by famous architect Frederick Law Olmsted and features a beautiful quad, conveniently located class buildings, and many renovated facilities.